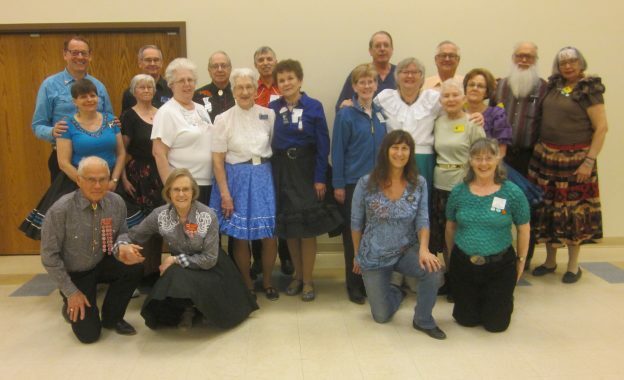 Saturday Fun Nite | Square Dance Minnesota, Inc.
March 24, 2018 – Saturday Fun Nite Square Dance, Fargo, Caller Charley Huhtala. Two squares with dancers from Country Twirlers, County Line Squares, Dakota Grand Squares, L & M Squares, and Valley Stars (see photo above) danced. County Line Squares Queen Susie, SDM Chair LeRoy Elfmann, and SDM Secretary Gael Zachman were present. County Line Squares returned and claimed a Saturday Fun Nite banner. This entry was posted in Activities on March 25, 2018 by LeRoy.